The palm tree and date fruit are national symbols of Tunisia, and Eden Palm is dedicated to showcasing the date palm’s important place in Tunisian history, heritage and culture. 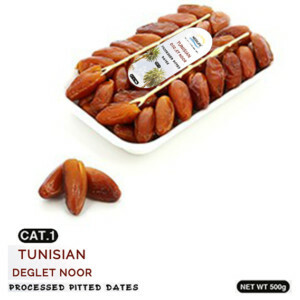 Cultivated in Tunisia since 5000 years. The Date Palm Tree is often named “the Tree of Life”. In the desert they the nomadic tribes often call the dates “bread of the desert”. So called probably because of their slight translucency and their elongated shape. Their seed can be seen right through the flesh when held to the light. 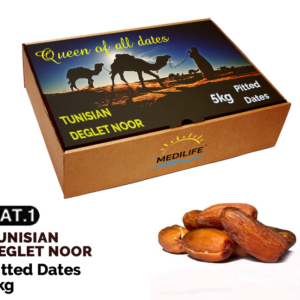 The Deglet Nour date is famous worldwide and often recognized as the best of all the dates. It is commonly referred to as the “Queen of all dates”. Branched dates are the premium extra dates, 100% Natural. The fruit is rich in dietary fiber, which prevents LDL cholesterol absorption in the gut. Additionally, the fiber works as a bulk laxative. It, thus, helps to protect the colon mucous membrane from cancer-causing chemicals binding to it in the colon. They are moderate sources of vitamin-A (contains 149 IU per 100 g), which is known to have antioxidant properties and essential for vision. Additionally, it is also required maintaining healthy mucus membranes and skin. Consumption of natural fruits rich in vitamin A is known to help protect from lung and oral cavity cancers. Dates are an excellent source of iron, carry 0.90 mg/100 g of fruits (about 11% of RDI). Iron, being a component of hemoglobin inside the red blood cells, determines the oxygen-carrying capacity of the blood. Further, they are excellent sources of potassium. Potassium is an important component of cell and body fluids that help regulate heart rate and blood pressure. Date fruits are also rich in minerals like calcium, manganese, copper, and magnesium. Calcium is an important mineral that is an essential constituent of bone and teeth, and required by the body for muscle contraction, blood clotting, and nerve impulse conduction. Manganese is used by the body as a co-factor for the antioxidant enzyme, superoxide dismutase. Copper is required for the production of red blood cells. Magnesium is essential for bone growth. It contains very good amounts of pyridoxine (vitamin B-6), niacin, pantothenic acid, and riboflavin. These vitamins are acting as cofactors help body metabolize carbohydrates, protein, and fats. Vitamin K is essential for many coagulant factors in the blood as well as in bone metabolism. Date is a universal Fruit that is consumed on daily basis worldwide, but also on specific religious celebrations for multiple religions. > Muslims : Ramadan . > Christians : Christmas . > Buddhist, Asia : Chinese New Year . > Jewish : Various occasions throughout the religious year . Dates are very in the Tunisian Jerid region, especially in Tozeur and Kebili. Dates are picked carefully; this allows us to obtain high quality of dates. Fresh dates: During the Harvest, all favorable conditions are taken to keep them fresh dates, with a delicious taste. 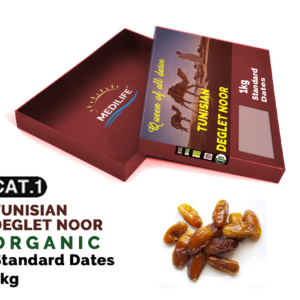 Dates are kept in a refrigerated area to ensure high quality dates. 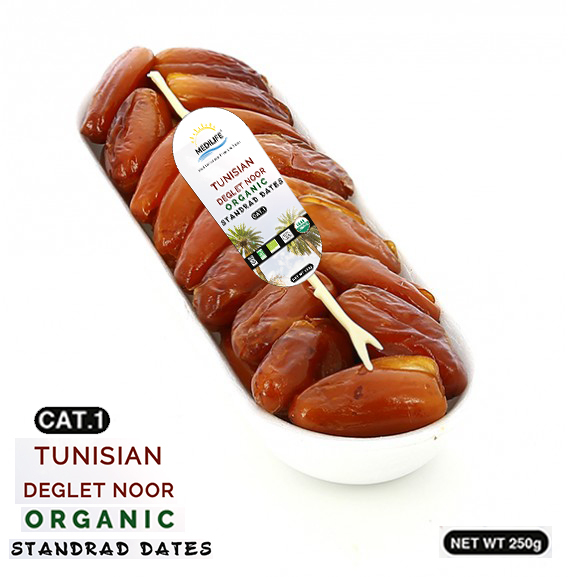 We always offer our customers 100% Tunisian high quality Dates. */ Glove Boxes (UK) including private label services (under certain volume conditions). 9. Free Samples. Express Shipping by DHL. Freight Cost is on Client. Refundable upon 1st Bulk Order. We welcome our Valuable clients to come and visit our fields and press. 11. We help our valuable clients for VISA application, and may contribute to their Travel Fees.